Kind of. But he doesn't claim to be whatsoever. 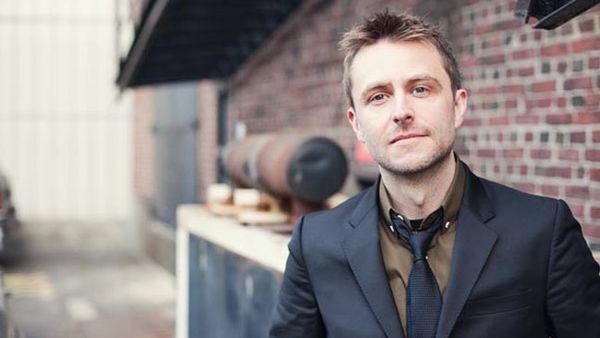 In my recent edition of "What I'm Reading," Chris Hardwick makes it clear from the beginning: "I AM NOT A LIFE COACH." 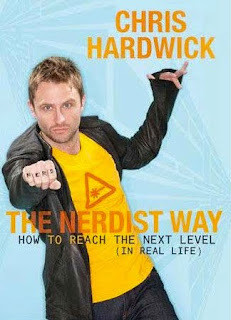 He has no intention of being a motivational speaker or a self-help guru in his book, The Nerdist Way ("How To Reach The Next Level - In Real Life"). Nevertheless, his witty words of wisdom are proving to be helpful as I prepare to head further into my (gulp) 30s and figure out what the hell is going on with my life (my birthday's five weeks away as I write this; gift ideas can be viewed over HERE). It may be hard to believe - actually, it's not - but this book was written for me. At least, that's how I feel. Although I can't recall ever being called a "nerd" to my face (I didn't grow up in an 80s teen comedy), I've always identified with this "sub-race" of human beings. I fit the criteria. I can finish the line, "You might be a nerd if..." with plenty of characteristics, scenarios, and examples. I never played sports. I owned an X-Files scrapbook which I meticulously - and proudly - assembled myself. I took AP Calculus (and passed). The particular obsessions, the unique thought processes, the ocassional withdrawal from social activities: guilty. Back in January I attempted to get a copy of the book signed by Hardwick himself down at Meltdown Comics on Sunset Boulevard where he presents his Nerdist podcast every week. 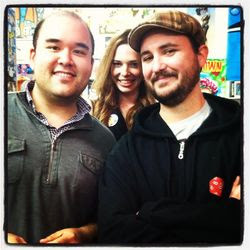 I had been invited by a publicist to check out the event, listen to Chris read some passages and answer some questions from his pal, Wil "Wesley Crusher" Wheaton (left), and then take advantage of some free booze and hot dogs at the afterparty. Unfortunately I showed up too late and missed out on the Q&A and signing, but I enjoyed some refreshments and got a kick out of watching The Almighty Nerdist interact and bond with his bookish brethren. I look forward to finishing this guide-for-geeks and being inspired to take charge of my "mind, body, and time." Take it away, Chris. *Confession: I have no idea why I included a Star Wars reference in the above title. I'm not even a fan (fanboys, bring your wrath). **And: the above pic of the dashing Mr. Hardwick was taken from the Los Angeles Times blogsite. All I think of when I heard Chris Hardwick is "Singled Out..."